Since when is speaking to an issue “bullying” or “reprimanding”? FWIW, I didn’t look at the posters profile or post count, because I was speaking to the issue, no personal affront intended at all. If I own a used Equalizer hitch that I paid $150 for on CL, and someone pays $3000 for a high end hitch, and neither of us has any sway, then isn't mine best? If it pulls as straight, as true, and as pleasingly predictable as a projection hitch at any speed, making the combination a pleasure to drive, then it would be better. But does it do these things? I LOVE these threads!!! It's good to see that after fifteen years of Airforums.com, they're still going strong! I used Reese Dual-Cams exclusively for thirty years on various trailers and for all of my Airstreams. Although they're not light, can be loud in use, and they're dirty to handle, they were a combination of not being too heavy or complex, reasonably priced, and gave excellent performance... every one of them. 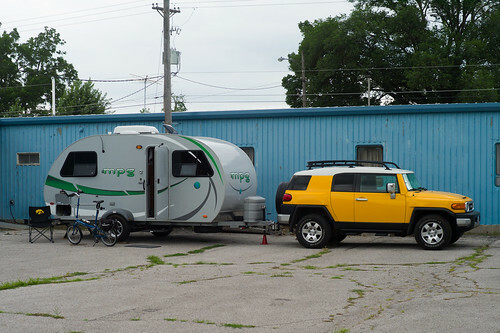 HOWEVER, in 2012 I bought a 2011 mpg 19' trailer and saw an Andersen display at the RV dealer's. I ended up buying an Andersen for that mpg that I towed with a short wheelbase Toyota FJ Cruiser. I pulled that mpg some fifty thousand miles in three years with the Andersen If I ever return to travel trailers, I will never again buy anything as heavy and dirty as a Reese, or as heavy, complex, and expensive as the Hensley and others like them. The Andersen is light-weight, simple, clean, quiet, and extraordinary good at what it's designed for. It's a brilliantly designed hitch. And they're relatively inexpensive and easy to install and use. The problem is - how does one objectively know? I bought a ProPride day one - have never towed with anything else - you can see previous posts of mine that describe my reason for that decision which I won't re-hash here. But how do I know? I know whatever I think I know about the different approach of the Hensley's and any other type of hitch. But unless I tested my current set up with 10 specific scenarios and then removed the PP and went with an XYZ and replicated the same exact 10 scenarios - I am somewhat taking this on faith am I not? I'm good with my decisions. Frankly, IF your towed load is properly balance for your trailer, you have the right proportion of weight on the hitch, and both your trailer suspension and your vehicle suspension are up to snuff, you'll never really need an anti-sway hitch. They're just insurance. However, people who tow trailers don't understand the dynamics of trailer sway, how it's initiated and why, so they spend big bucks on hitches, not for insurance, but to insure that they don't have to be bothered with the consequences of not properly maintaining their equipment, or having the trailer loaded properly. Now, that said, I towed a 34' tri-axle, two door Airstream with a Y2K Ford Excursion, and ended up having to do a fair amount of suspension mods to the Ford to make it a decent tow vehicle as Ford's engineering was screwed up from the factory. THEN, Bigfoot Industries introduced the 17.5' trailer in 2005 and had the axle placed too far forward for the weight in the increased-sized fresh water tank. That unloaded the hitch weight big-time and caused folks ALL kinds of grief with sway problems. The factory solution was to weld an additional 300 lbs of metal plates to the tongue. So there ARE problems that are factory-built into vehicles and trailers. Fortunately, as far as I know, Airstream has never built a trailer that had a sway problem inherent in its design. So there ARE good reasons to have sway control hitches, but the best way remains having your trailer load balanced, and keep your top speed under that at which sway commences for your combination of trailer and tow vehicle. Have you ever noticed with your PPP that when your on an exit or entrance ramp that the AS follows directly behind with very little 'bend at the ball"?,(what a great name for a rock band). When folks ask me why I use a Hensley I just tell'em...."cuz it helps keep whats on my my ball in line." The problem is - how does one objectively know? ... I am somewhat taking this on faith am I not? There really aren't any "bad" sway-control hitches out there, nor are there "better" hitches... only more expensive hitches. It really depends on what flaws you're trying to overcome in your tow rig combination. For my last one, it was a short-wheelbase tow vehicle. For my 34' Tri-axle it was sloppy handling that turned out to be rear-axle steering with the Excursion because the spring stack wasn't strong enough to hold the body squarely over the axle while towing. The best hitch for you is the one that works well for you. On the ball both of my 31’ Airstreams were prone to sway at the slightest provocation above about 60 MPH, no matter how the load was adjusted, and even with no load at all. With my premium hitch, my trailer can’t even be made to sway, even with no tow vehicle mods. Trailer sway on my trailers is caused by the trailer, not the TV. A ProPride or Hensley is not a patch, it is a fix. Emphasis added. Exactly the real point. If it works for your setup, and works well, then it is the best--for your circumstance! We can debate endlessly, but in the end, we own and live with our own decisions. For me, the one-to-one comparison between what the AS came with (Husky Brand, WD bars, no real sway control) and ProPride (Flat-out locked out sway) leads me to conclude the ProPride (Hensley 'improved' design) was the way to go in the areas I travel in...and a 5,000 mile plus test run validated that decision. Thank you! As you noticed most just chose to ignore the root cause. The problem is - how does one objectively know? The easy answer is: You tow with it. Don't get me wrong, I'm not trying to talk anyone into or out of buying either. Buy two if you like. The $3000 hitches are a marvel of engineering, I think. But mine does the job as well. $2850 in my pocket buys plenty of accessories that make my trip smoother also. A person who knows what a stable combination feels like will know the difference between bad, good, and great. I can easily tell the difference between a bad, not-so-good, good, and great towing experience. I just check my pulse rate and color of my knuckles to tell between not-so-good, good, and great.